FASTER AND BETTER THAN EVER BEFORE"
community can support new projects and get exclusive rewards for it." A new site has launched called Simfunding. 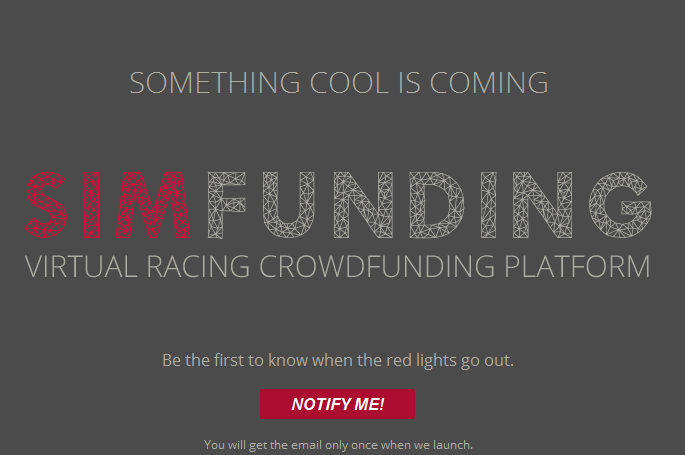 They're promising a dedicated space for individuals/groups looking for crowdsourcing of their sim racing projects. The site seems to function similarly to other crowdsourcing sites such as: Kickstarter, GoFundMe, CrowdSource, etc. A user would post projects with a dollar goal and the supporters of that project would be able to donate money to reach the creators' goal which usually has some sort of incentive to attract more donations. If the project doesn’t reach its goal, all money is returned. The site is launched, it's live but the is not functioning as its purpose right now (crowdsourcing). They are allowing you to submit ideas. Simfunding is an interesting concept that could potentially fill a need not currently met in the sim racing world. However, we simply cannot comment right now as to how this will work. Take a look at their website and read the "How It Works" page. Please share any comments/opinions below!